A bomb squad attended the scene after the suspicious package was found under a vehicle. However it’s thought that the object is not dangerous. Journalist Scott De Buitléir has tweeted that police barriers are being removed after a bomb squad determined that the object found under a vehicle is not dangerous. THE US EMBASSY in Oslo, Norway has been evacuated after security staff found a suspicious object beneath a nearby vehicle. Norwegian police said the embassy and the surrounding area, including the royal palace, were cleared of people in the heart of Norway’s capital, and that a bomb squad with sniffer dogs was dispatched there. 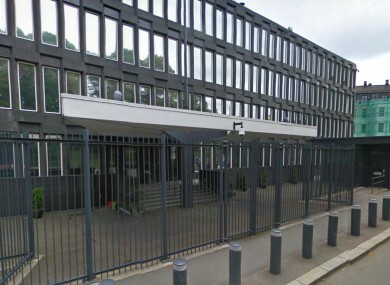 Police spokesperson Martin Todnem said that around 500 metres surrounding the embassy has been cleared, after security guards made a call just after 11.20am this morning. The NTB news agency reported that visitors to the royal place, the residence of the nation’s monarch, were also cleared, but that its staff members remained there. The royal family was not in the palace at the time. Norway’s Aftenposten newspaper is reporting that a bomb squad is on site along with other emergency services. Email “Update: US Embassy in Oslo evacuated after discovery of suspicious object ”. Feedback on “Update: US Embassy in Oslo evacuated after discovery of suspicious object ”.